Professor Mark Tooley is currently president of the Institute of Physics and Engineering in Medicine. He retired as head of the Department of Medical Physics and Bioengineering and Director of Research and Development at the Royal United Hospitals in Bath in July 2017. 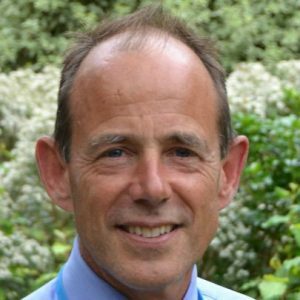 He is a consultant clinical scientist, a visiting professor with the University of Bath and the University of the West of England and a medical technologies consultant. Mark has a BSc in electronic engineering from the University of Bath, sponsored by industry, and an MSc and PhD in medical physics from the University of London. His PhD research was inventing, with a cardiologist colleague, a novel method of discriminating between various arrhythmias in cardiac implantable devices. Mark’s interests are in medical technology, data analysis in medicine, physics applications in anaesthesia, simulation and modelling in medicine, biological signal processing, physiological measurement, cardiac implantable devices, and novel patient monitoring solutions. He is a chartered engineer, a chartered scientist, and a fellow of the Royal Academy of Engineering, the Institution of Engineering and Technology, the Institute of Physics and Engineering in Medicine, the Institute of Physics (IOP) and the Royal College of Physicians.